- possibility to buy 4 additional season tickets. - the seats of the 2016/17 season ticket holders will remain booked until June 30, after which they will also go on general sale. 1. Discounts up to 20% on tickets and Champions League packages (Shakhtar are participants in the competition’s group stage). 2. Priority right to be the first to choose the best seats and buy tickets for all European club competition matches. 3. Possibility to purchase additional tickets for the Champions League. 4. 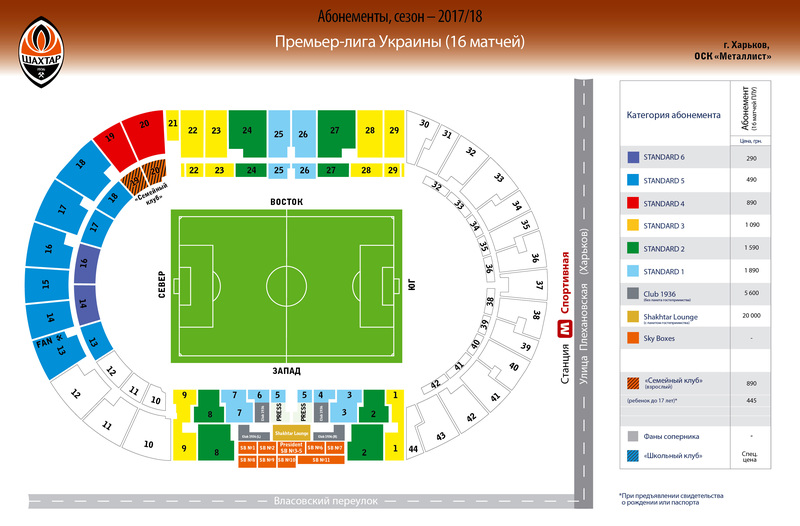 Saving time and money when buying tickets for all the games in the Ukrainian League (up to 30% of the total ticket price). 5. Permanent seat in the stand of the OSC Metalist. 6. Discounts of up to 15% on the Fan Shop merchandise depending on the season ticket category. 7. Participation in the discount programme (bonuses for attending league games and progressive discount for the next season). 8. Staying in touch with FC Shakhtar, participation in all loyalty programmes and prompt informing ticket holders about important events. Family Club: UAH 890 (50% off for children under 17). Contact phone for season tickets to Sky Box corporate boxes is +38 067 620 40 11. The stadium ticket office is open from 9:00 to 20:00. When purchasing a season ticket, the fan should produce their passport or driving licence and fill out a questionnaire. Call +38 044 498 13 88 for details.